It's been such a long, long time since I've had any time to craft for fun. Life with my wee 7 month old girl is busy and she doesn't like to sleep, so getting me time is virtually impossible. She did however give me an evening at the weekend so out came the crafting goodies :) Even though I've had no crafty time for the best part of a year that hasn't stopped me buying supplies and taking advantage of sales!! My stamp collection has grown........alot......and they have been patiently waiting to get inked up! 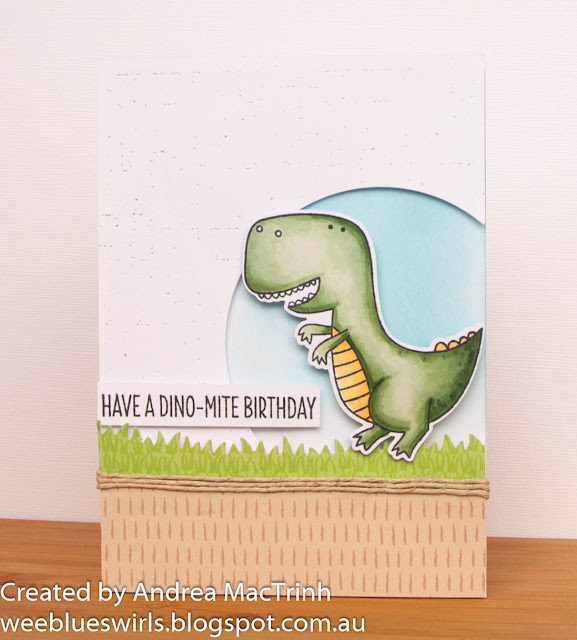 I have a severe lack of masculine cards so decided to ink up the MFT 'You're Rawr-some' stamp set first and got the opportunity to play along with My Favourite Things Sketch Challenge. Yipee :) Here is the sketch. 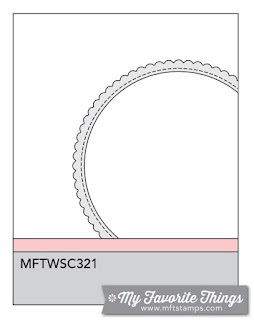 I took a piece of white card the same size as card front and cut out a partial circle using the a radial stitched circle. I then run this card through my die-cutting machine with an impression plate. I added a strip of grass, designer paper and some twine. Before mounting the new card front on the base I sponged a blue sky on the base using tumbled glass distress ink. I coloured in the dinosaur with my copics and used the co-ordinating die to cut it out. I mounted it into the scene. The sentiment was stamped in tuxedo black ink. Adorable card! Thanks for sharing it with us for our Birthday Card challenge at Cut it Up! This is an awesome card- love the CAS look! So hard to accomplish... Thanks for playing with us at Come and Get It!